Er, well it’s not morning anymore. But pretend it is. 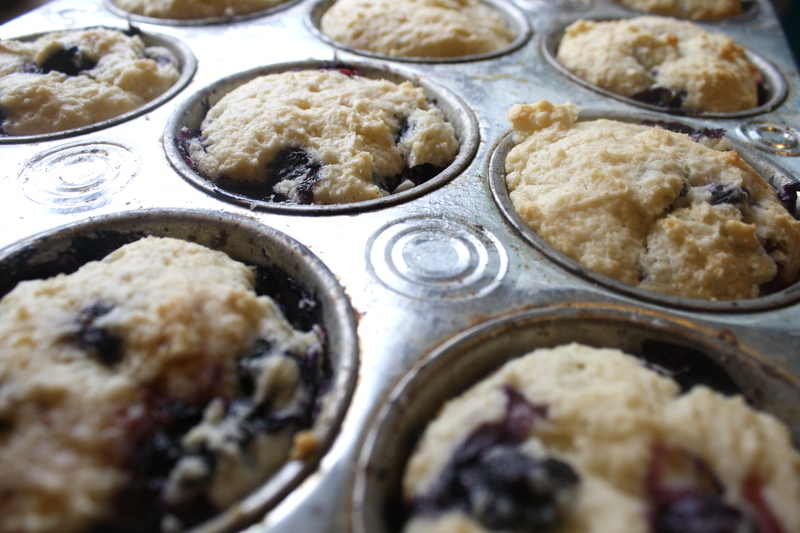 And pretend that you’re just waking up, stretching your legs and getting out of bed when it hits you: the smell of sweet, gooey blueberry muffins wafting from the oven. Your stomach growls. You come downstairs, still bleary-eyed and sleepy to find a hot cup of coffee and a still-warm muffin with a melty pat of butter on top waiting for you to devour. This would never happen in real life. Just pretend. It’s okay though, because this didn’t happen in my life either. Because, come on, if you think that I’m waking up early enough to bake you muffins, you’re crazy. Out of your mind. Completely bonkers. I might have also eaten a muffin out of the pan while they were cooling. Just to make sure it wasn’t poisonous. Shh, it was for science. And muffins are healthy, right? I trick myself into saying this every time I eat them. Because they’re not cupcakes, oh no. No frosting. Less sugar. Plus, these have fruit in them. They’re practically a health food. Go on, eat two. These are super easy. Easy enough that (if you aren’t lazy like I am) you could make them no problem in the morning. However, they can also be made ahead, eaten at room temperature or salvaged in the toaster oven. They’re sweet, but not too sweet that you feel like you’re eating dessert in the morning. They’re moist, especially when you bite into a glob of gooey blueberry. Basically, these are one of the perfect things to wake up to in the morning. Preheat oven to 375 degrees. 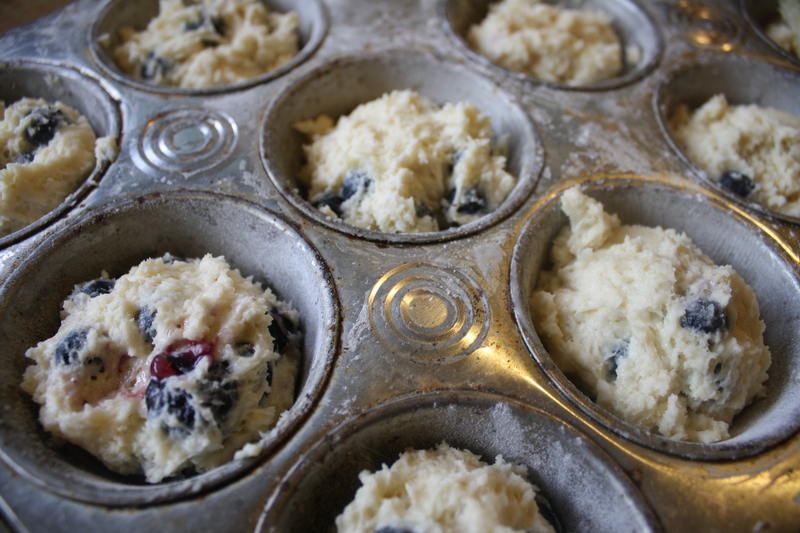 Line muffin tins with about 18 cupcake liners, or butter and flour them. Combine sugar and lemon zest in a mixing bowl. With your fingers, rub the sugar until the zest is combined and very fragrant. Add the butter and cream the butter and lemon sugar until light and fluffy. Add eggs, one at a time, beating well between each addition. Add vanilla and sour cream and beat until well combined. Add half of the dry mixture into the bowl. Slowly beat until just combined. Add the other half and mix until almost fully incorporated (leave a few streaks of flour). 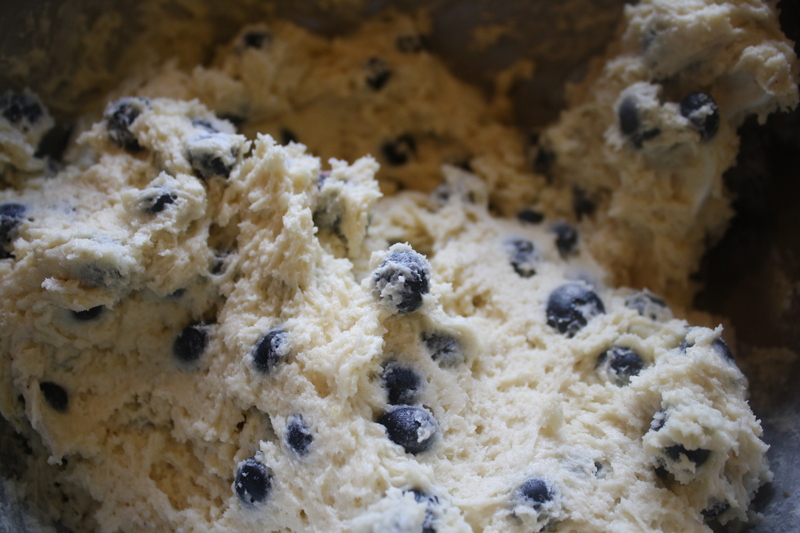 Add the blueberries and fold in by hand, making sure no more streaks of flour remain. 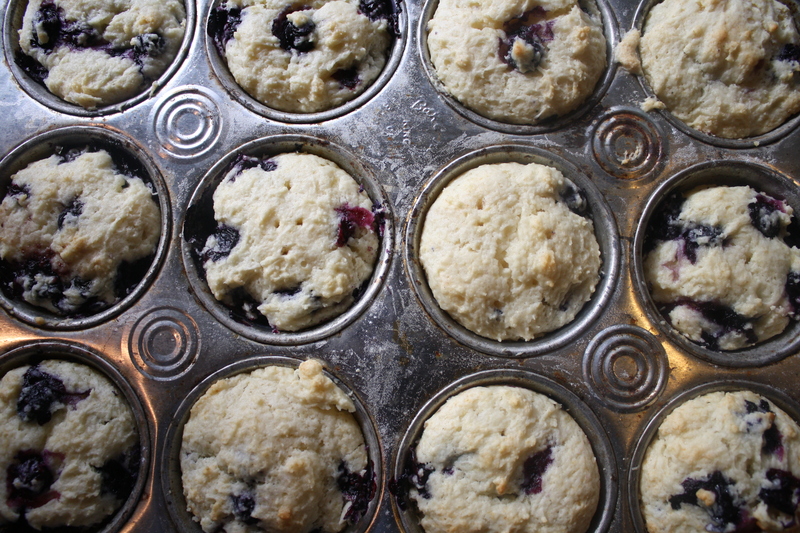 Divide batter between cups in the muffin pan, so they are beach about 3/4 of the way full. Bake for 20- 30 minutes, until top is slightly golden and a cake tester comes out clean (don’t mind blueberry goo). Let cool slightly before serving. Or, turn out of the pan and let cool all the way, reheating in the toaster oven when ready to serve.